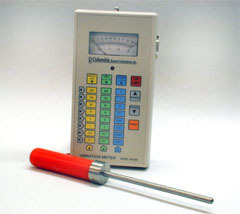 The Columbia Model VM-300 Vibration Meter is a general-purpose vibration measuring instrument for periodic routine vibration checks of industrial machinery and general field use where portability and ease of use are required. This hand-held device is the ideal preventive maintenance tool. Model VM-300 operates from a rugged, precision piezoelectric accelerometer and incorporates a charge amplifier input stage for stability and minimizing errors. Operation is controlled by an internal integrated microcontroller acting under direction of a splash-resistant 7- key membrane keypad. The sensor probe contains the piezoelectric accelerometer which outputs an electric charge proportional to the instantaneous value of the applied acceleration. This charge signal is communicated to the VM-300 instrument through a low-noise coaxial cable and is processed with a charge amplifier whose output is a voltage signal proportional to instantaneous acceleration Alternatively, Model VM-300A is supplied with accelerometer and 10" cable assembly in lieu of handheld probe. 0.1 to 300 in/sec F.S. 0.001 to 3 inches F.S. 0.1 to 300 g F.S.